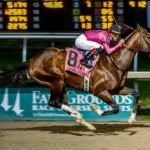 NEW ORLEANS – It’s says in some weathered chapter of the horseman’s manual that you can get away with running a turf horse on a sloppy track, and when War of Will, who is turf-bred and made his first four starts on turf, won his dirt debut Nov. 24 at Churchill Downs, he did so on a sloppy track. But what we apparently have here is not a turf horse who managed a wet-track win, but a natural dirt horse originally miscast as a grass horse. For as good as War of Will looked beating maidens in the Churchill slop, he looked even better winning the Grade 3, $200,000 Lecomte Stakes over a Fair Grounds main track rated fast. 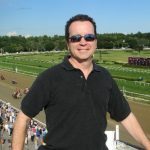 War of Will, a barely controlled bundle of energy stalking the pace wide down the backstretch under Tyler Gaffalione, inhaled Manny Wah at the top of the stretch and ran off to a four-length win in the Lecomte. The performance was visually impressive and pretty good on the clock, War of Will stopping the timer in 1:43.44 for the one mile and 70 yards. That was nearly two seconds faster than Needs Supervision’s winning time in the Silverbulletday Stakes over the same distance one race earlier.